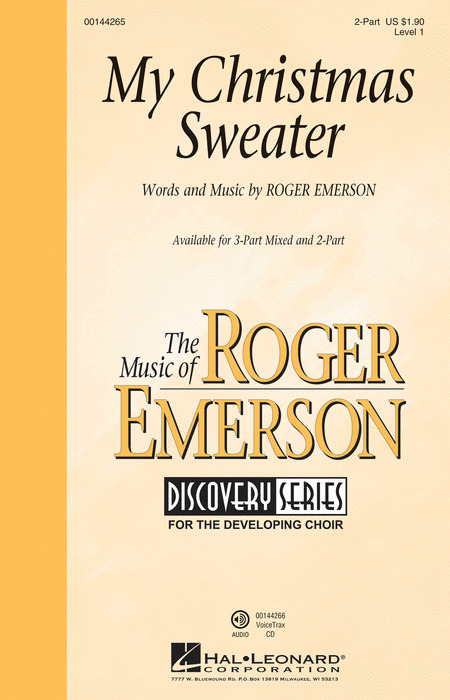 Roger Emerson is a professional composer and arranger with over 900 choral titles in print and over 30 million copies in circulation. He is the most widely performed composer/arranger of popular choral music in the world today. Mr. Emerson has been the recipient of ASCAP's Standard Award for 20 years running and his works have been performed at the White House, Carnegie Hall and the Kennedy Center. He is in constant demand as a lecturer on pop music and the changing voice and has appeared at numerous MENC and ACDA conferences. Displaying 1-50 of 90 items. Originating from the busking scene in cities across the nation in the 1980s, street bucket drumming has become inseparable from the modern-day music teacher catalog due to its reliance on found materials, overabundance of plastic and coolness factor. Paired here with choir, this arrangement seamlessly blends the two disciplines into a rock anthem with style! Now available in SAT(B) voicing with flexible tenor & bass parts, this time-tested arrangement is now more accessible than ever. With the finely crafted vocal arranging of Roger Emerson, this powerful spiritual can't miss on your next program. This selection works wonderfully for young voices with its syncopated rhythms and carefully selected vocal ranges. A winner! Roger Emerson's 'friendship' songs are absolute classics! This latest is no exception, with easy call-and-response harmonies and irresistible hook. And wait till you hear the catchy final chorus! An excellent showcase for young choruses! Available: 3-Part Mixed, 2-Part. Approx. Time: 2:00. This contemporary original is a buoyant Christmas celebration for school or church choirs of all ages. Easily learned and a joy to perform! Available: SATB, 2-Part, 3-Part Mixed, ShowTrax CD. Performance Time: Approx. 2:30. Roger Emerson : Can You Hear the Bells? The sounds of bells ring out in this exciting secular work for young choir. Cluster and quartal harmony approached stepwise are the hallmarks of this piece which features an optional bell part. A lyrical middle section provides a vivid contrast. An excellent opener! Available separately: 3-Part Mixed, TB and VoiceTrax CD. Performance Time: Approx.2:00. The sounds of bells ring out in this exciting secular work for young choir. Cluster and quartal harmony approached stepwise are the hallmarks of this piece which features an optional bell part. A lyrical middle section provides a vivid contrast. An excellent opener!Available separately: 3-Part Mixed, TB and VoiceTrax CD. Performance Time: Approx.2:00. This vibrant setting of the Cantate Domino text features exciting Brasilian vocal lines over a samba-flavored accompaniment. Dynamic contrasts and call-and-response patterns make this work especially appropriate for developing choirs. Available separately: SATB, SAB, SSA. Performance Time: Approx. 2:00. Haunting chant-like lines build to create a compelling and dramatic texture in this contemporary setting of a traditional Latin text. 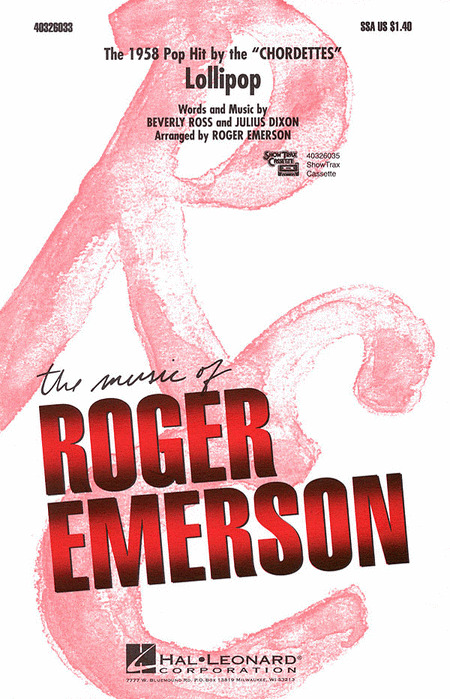 In the tradition of Roger Emerson's powerful festival works, this will be a strong addition to any concert program. Available: 2-Part, 3-Part Mixed. Performance Time: Approx. 3:30. Now available in a flexible SATB voicing, this driving rock spiritual features a subdued opening that explodes into high-powered energy sure to be a hit with your developing mixed choirs in middle and high school. Famous for his contemporary settings, Roger Emerson has done it again with this driving rock spiritual reminiscent of Sinner Man. The subdued opening explodes into high-powered energy sure to be a hit with your developing groups. Available: 2-Part, 3-Part Mixed. Performance Time: Approx. 2:25. Roger Emerson : Elijah Rock! This driving spiritual is placed in a well-crafted setting for younger choirs. An excellent choice for beginning ensembles. Available: 2-Part, 3-Part Mixed. Performance Time: Approx. 2:30. 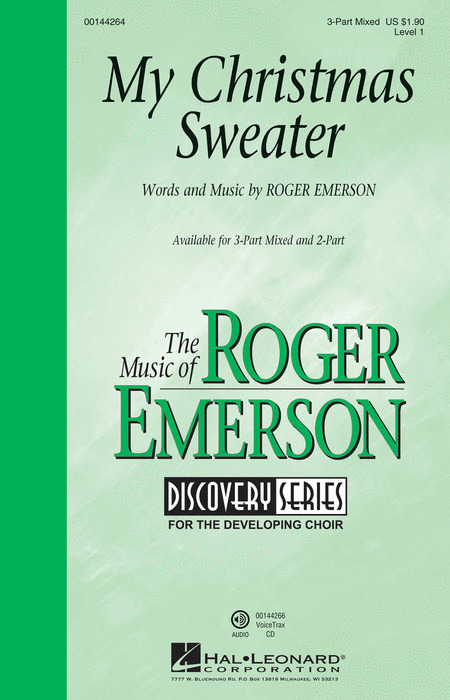 Young choruses will sound their best with this irresistible original from Roger Emerson. Easily learned call-and-response lines and a winning text makes this selection perfect for your next concert!Available separately: 3-Part Mixed, 2-Part and VoiceTrax CD. Performance Time: Approx. 2:30. Discovery Level 1. Roger Emerson : Good News! This adventurous spiritual arrangement is a great confidence builder for developing choirs. Powerful and dramatic, with interesting harmonies and driving accompaniment, it makes an excellent concert and festival finale! Directors of younger ensembles have come to depend on Roger Emerson's contemporary arrangements of spirituals for a great source of concert and festival material. With a triadic chorus and final descant, this setting is exceptionally strong! Available: 2-Part, 3-Part Mixed. Performance Time: Approx. 2:30. With its memorable lyrics, this inspirational American Indian prayer will be a stirring addition to any concert. Optional recorder/flute and percussion. Available: 3-Part Mixed. The legend of John Henry and his hammer are brought to a new generation in this boogie woogie arrangement that drives from beginning to end. Great for younger choirs! Available: 2-Part, 3-Part Mixed, ShowTrax CD. Performance Time: Approx. 2:15. The legend of John Henry and his hammer are brought to a new generation in this boogie-woogie arrangement that drives from beginning to end. Great for younger choirs! Available: 2-Part, 3-Part Mixed, ShowTrax CD. Performance Time: Approx. 2:15. Roger Emerson : Just Sing! Celebrate the power of music in our lives and how it can soothe our troubled souls. This easy, well-crafted original will speak straight to the heart and will add a warm, affirming message to your program! Available separately: SATB, SAB, 2-Part, ShowTrax CD. Duration: ca. 2:45. Celebrate the diversity of the season with this original song that teaches about the December holiday of Kwanzaa. Available: SATB, SAB, 2-Part, ShowTrax CD. Performance Time: Approx. 2:30. 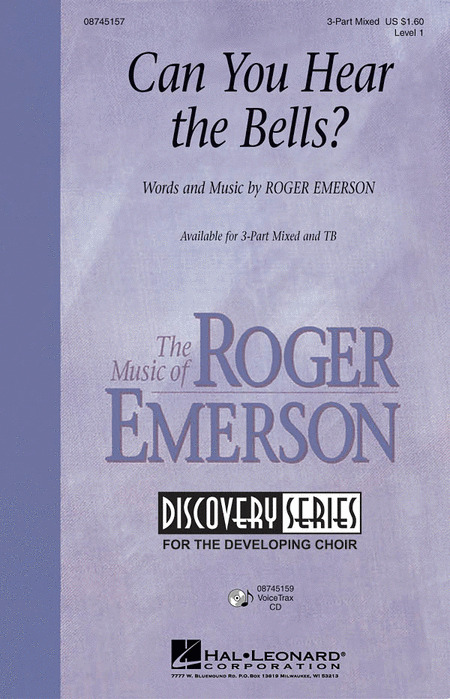 Now available in an easy SATB edition, this classic Roger Emerson arrangement is a great confidence builder for developing choirs. Powerful and dramatic, it makes an excellent concert and festival finale! Available separately: SAT(B), 3-Part Mixed, VoiceTrax CD. Duration: ca. 2:30. This male chorus setting of the familiar chorale offers a number of options for the developing ensemble. Perform the traditional a cappella version or use the contemporary piano accompaniment for an interesting stylistic contrast. Available: TBB. Performance Time: Approx. 2:00. The fun-filled 1958 pop classic by the Chordettes! Roger's SSA arrangement captures the authentic "girl group" sound. Great fun! Available: SSA, ShowTrax CD. Performance Time: Approx. 2:00. This American folk classic makes a fine choice for young choirs' concert and festival programming. An excellent selection for building tone and blend, it also includes a simple guitar part for student players. This American folk classic makes a fine selection for young choirs' concert and festival programming. An excellent selection for building tone and blend, it also includes a simple guitar part for student players. The haunting spiritual in an accessible arrangement for middle school choirs. Available: 3-Part Mixed. Performance Time: Approx. 3:00. The Christmas spiritual Mary Had a Baby and the gospel version of Joyful, Joyful make a perfect pairing for an uplifting seasonal showcase! Well-crafted and accessible, this will bring energy to every holiday program! Roger Emerson : Music Is My Life! Opening in a simple rubato style, this contemporary original soon moves into a driving 4/4 that expresses the positive impact of music. A powerful showcase for young singers and a great concert opener or concert theme. Available separately: 3-Part Mixed, 2-Part, VoiceTrax CD. Duration: ca. 2:50. Dig to the back of your closet for your best ugly Christmas sweater and make it the highlight of your holiday program! All in fun, this song lends itself well to choreography and your singers and audiences will love it! Avast ye mateys! This rollicking original will be the hit of any concert. Perfect for men or treble choirs your students will have a blast with some easy 'pirate' choreography. Not to be missed!Available separately: 2-Part, TB and ShowTrax CD. Performance Time: Approx. 2:00. Younger choirs will develop important part-singing skills with this contemporary treatment of the Latin text used by Michael Praetorius at the turn of the 17th century. Syncopation and vivid dissonance make this an exciting and impressive work for Christmas and concert performances. Available separately: 3-Part Mixed, 2-Part, VoiceTrax CD. Duration: ca. 2:30. Set in a haunting, contemporary style, this American favorite is an excellent choice for young choirs' concert and festival programing. Set in a haunting, contemporary style, this American favorite is an excellent choice for young choirs concert and festival programing. Now available for men's voices! Set in a haunting, contemporary style, this American favorite is an excellent choice for young choir concert and festival programing. This Emerson original captures the spark and color of the celebrated Irish musical tradition. Dance to the tune, sing to the moon, aye, shule a-roon; let the river take you! Available: SATB, SAB, 2-Part, Instrumental Pak, ShowTrax CD. Performance Time: Approx. 4:00.